Mike Leavitt and Tom Daschle sit on different ends of the political spectrum, but share the goal of seeing a public-private partnership drive healthcare innovation. 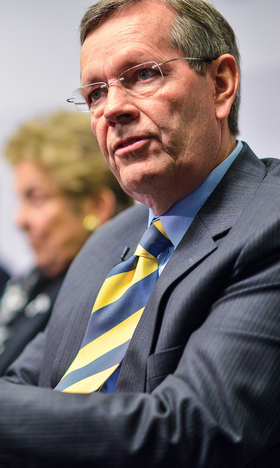 Leavitt, a former HHS secretary and Utah governor and current head of Leavitt Partners, and Daschle, a former leader of Senate Democrats, recently shared their thoughts on policy and innovation with Modern Healthcare editors Paul Barr and Matthew Weinstock. 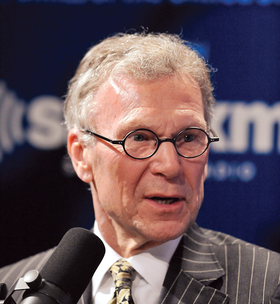 Tom Daschle: The demographics of Medicare almost dictate that you're going to see expanded growth because baby boomers like me are increasingly a factor in how one looks at the larger number. My fear is that policymakers are going to look at cost- saving measures for Medicare and simply resort to what we always do, which is shift the cost onto something else rather than look at the universe of health and really try to solve the cost problem in a meaningful way where we repair and improve. The cut-and-shift model works in the short term for the federal budget process, but it doesn't work in solving that larger issue about per capita costs, whether they're public or private. Daschle: There aren't any home runs yet, but we're going from singles to doubles at least and that's encouraging. Healthcare as a public-private partnership ... that's going to require more risk for the private sector, but some commitment to stabilizing risk on the public sector with reinsurance just as we did with Medicare Part D and Part C, which are probably the greatest success stories in terms of the integration of that public-private partnership. Mike Leavitt: One of the reasons (alternative payment models are) growing slowly is because people don't know yet how to do it and the competencies are not yet developed. Payers—the federal and state governments being among the biggest—are going to have to continue putting steady pressure; if they put too much pressure, people will turn back. It's not going to be done solely with legislation. It's not going to be done in politics. It's going to be driven by economics and the market will begin to reshape and react to it. Leavitt: It will be integrated systems, of which hospitals are only a part. They will be integrated systems that either own or are owned by a payer. It will be hospitals that have long-term-care assets, that have a physician practice and that have created the collaborative capacity to work together. I think you'll see device companies and pharmaceutical companies begin to step into this and say, "Wait a minute, we could be part of this. We can go from just being a chemical assembler—a pharmaceutical company—to a healthcare company and we could begin to take risk based on the validity of our product." Daschle: The whole infrastructure landscape is going to change. Aetna CEO Mark Bertolini recently said the new models are not in the health field space. The models are Amazon and Tesla as the way we to look at healthcare and the way healthcare entities interact with people themselves. So I think you have leaders in the field who are trying to break out of the old mold and really redesign the whole notion of what healthcare will look like.